See guys, this is what I sit and debate and debate and debate when it comes to making a cake. These are only just a few points going through my head too. Okay, so I picked and prodded and used pieces I wanted. It was easy that way. 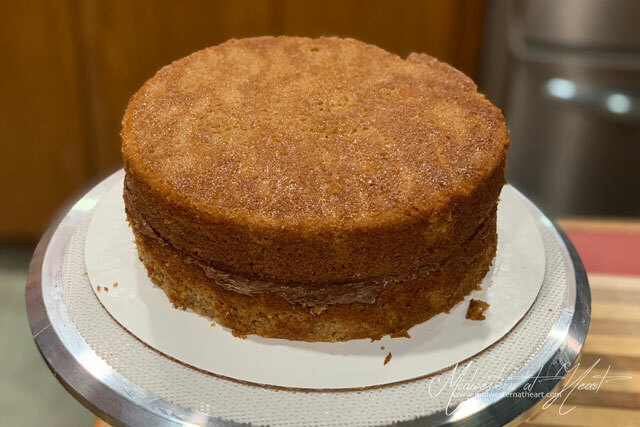 So this particular cake used the recipe that Gemma created. She used whole wheat flour to help convey that graham cracker taste and feeling of a s’mores. I must admit now that I’ve never heard of using whole wheat flour in a cake. It was good. They baked up so nice and flat which sucked. No top for me to cut off and try… so I trimmed one anyway. I had to make sure it tasted good. Guys, I could have eaten a whole cake layer by myself with a fork and no icing. It was that good. Now, if you read her recipe, she made this batter into 3 6″ layers. I wanted 8″ layers so I just made one batch, baked it in 8″ tins. While that was baking, I made a second batch and baked it. That gave me 4 8″ layers. I wanted a tall cake after all. Okay, so I don’t really know what to call it… So just go with it! In all my searching for “the perfect cake,” I came across a way to make chocolate chards. Now, if you remember the contents of a s’more, it uses graham cracker, in the cake, check. Chocolate is another key component. I decided to accomplish this in 2 ways. One of which being on the outside. It is kind of like a sneak peek at what they might find on the inside. So with cakes, typically the thing to do is to do a ganache that you let dip down the side. I wanted something a little different. Enter in the chocolate chards. So basically you make a chocolate ganache, a thick one. Then you spread it on parchment paper. Place it in the refrigerator for at least 30 minutes to an hour plus. Then you unroll it. As it unrolls it breaks into chards. And Bam, you have chocolate chards. Easy peasy lemon squeezy. Just don’t handle them too much because the heat of your hand makes them want to melt quickly. 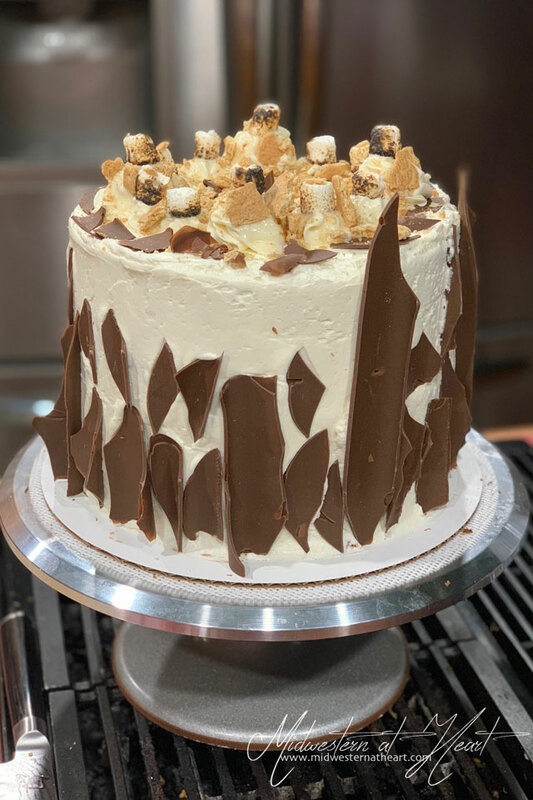 The second way I decided to incorporate that chocolate into this s’mores cake is by adding a chocolate buttercream between the layers. This goes back to Gemma’s recipe/method. In her cake, she used 3 6″ layers. I turned mine into 8″ layers so I made a full batch of the chocolate buttercream. When I realized I had some chocolate buttercream leftover, I went ahead and used it for my crumb coat. My thought was, amp up the chocolate flavor. Plus why waste perfectly good buttercream? Then it was time to put the cake into the refrigerator to chill for 20-30 minutes. Perfect amount of time to make my Swiss Meringue Buttercream! Swiss Meringue Buttercream is different than American Buttercream in that it uses eggs. You cook the eggs so there is no rawness to it. Basically, you make a meringue and then add butter. That meringue stood in for the marshmallows. I covered the whole cake in the Swiss Meringue Buttercream. If you have never tried it before, it’s not nearly as sweet as American Buttercream. It uses granulated sugar versus powdered sugar for the sweetness. Now, I wasn’t too terribly worried about getting it smooth as all get out because I was putting the chocolate chards on the outside. While the chocolate chards didn’t totally cover up all my imperfections on the Swiss Meringue Buttercream, it did a good enough job for what I really wanted to accomplish. I was totally pleased. I had a few small pieces of the chards leftover after decorating the side so I broke them up and placed them sporadically around the top of the cake for a little added extra chocolate. Now, this is where it almost fell apart on me. My goal then was to put mounds of the remaining icing on top of the cake. I was going to use my kitchen torch and give it that toasted marshmallow flavor. But hello, I had butter in that Swiss Meringue Buttercream. The butter melted. Whoops. Big Whoops. This is when you step back and try again. So I grabbed the marshmallows out of the cabinet (even if they were the mini marshmallows). I used my kitchen torch to toast them. Placed them on top of my mounds of Swiss Meringue Buttercream. And finished it off with broken up pieces of graham cracker. This totally let them know it was a s’mores cake. So what happened? Turns out it was a ticket auction. People bought tickets and put them in the different auction items. Sherri told me that this was the 2nd highest bid on auction item. And guess what? Sherri won it. How funny is that? And truthfully, I think I’m going to have to make this for myself, minus the marshmallows on top just so I know what it tasted like. 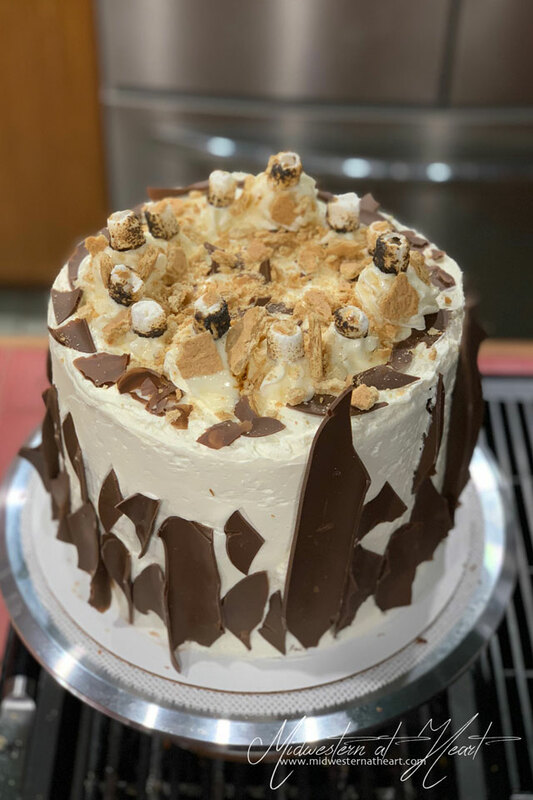 It’s like a s’mores but better and in cake form!! graham cracker, broken into small pieces. For the Cake: Keep in mind, the x2 on the cake helps to make 4 layers of 8″ round cakes. The cake recipe as is making 3 layers of 6″ cake. Add to a medium bowl the flour, baking powder, baking soda, cinnamon, and salt. Whisk until well combined. Using a stand mixer, cream butter on medium to medium-high speed for 2-3 minutes until pale in color and fluffy. Reduce speed and add eggs, one at a time, mixing well to fully incorporate. Add vanilla. Add in half of the dry ingredients followed by the buttermilk and finally the rest of the dry ingredients. Scrape the bowl after each addition and as necessary to make sure all ingredients are fully incorporated. Be sure not to overmix the batter or your cake will be tough. Pour batter evenly into prepared cake tins. Smooth the top with a spatula, then whack against the counter to try and make as level as possible. Bake 35-40 minutes or until a toothpick inserted into the middle of the cake comes out clean and the cake springs back to the touch. 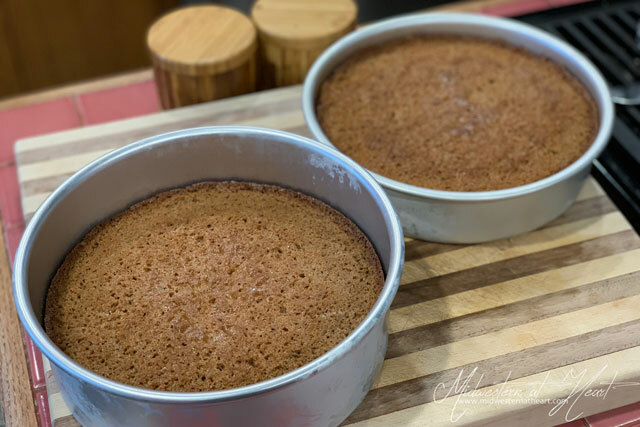 Remove from oven and allow to cool 10 minutes in the cake pans before turning out to a cooling rack to completely cool. For the Chocolate Chards: While the cake is baking, work on the chocolate chards. Place the chocolate candy melts into a microwave safe bowl. Melt in microwave about 2:30 seconds stirring every 30 seconds until all melts are melted and smooth. 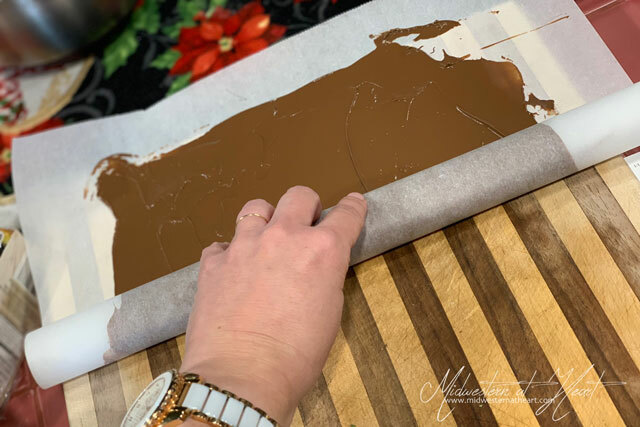 Lay a piece of parchment paper out flat on the counter and pour the chocolate candy melts into a thin layer. Then using an off-set spatula, spread the candy melts into a thin, even layer. Quickly roll up the parchment paper starting at one end and ending with the other (kind of like doing a cinnamon roll). Place parchment paper in the refrigerator for 30 minutes to an hour plus. Leave there until ready to use. For the Fudge Icing: In the bowl of a stand mixer, beat the butter until pale in color and fluffy. Add the sifted powdered sugar a little at a time and mix well. It will get light in color and grow in volume. Add vanilla, cocoa powder, and milk. Turn mixer on slowly so not to slosh milk out or get covered in cocoa powder. Be sure to continually scrape down the sides of the bowl. Turn mixer to medium speed. Beat frosting until spreadable consistency. If the icing is too thick, add a tablespoon of milk at a time to reach desired consistency. For the Swiss Meringue Buttercream: Place a pan of water over the stove and bring to a simmer. Combine the egg whites and sugar in a metal bowl with a whisk. Place bowl over simmering water and stir/whisk until sugar is dissolved and the mixture reaches approximately 160˚F. 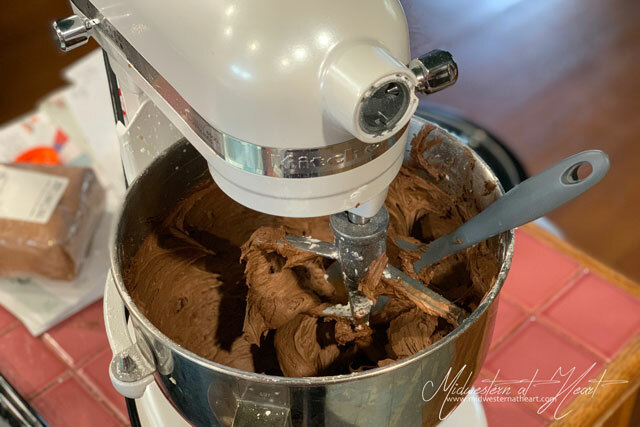 Immediately place the bowl on the stand mixer and whip on high with the whisk attachment until frosting becomes thick and glossy, forming stiff peaks. 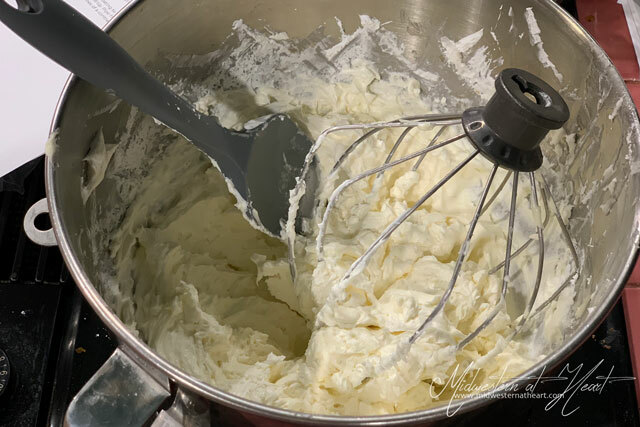 Continue to whip icing until the bowl feels room temperature to touch, about 10 minutes. Switch to the paddle attachment of the mixer. Turn mixer on low. Add in butter, 1 tablespoon at a time, beating until smooth after each addition. If the icing appears curdled or clumpy at any time, increase the speed of the mixer to medium-high and beat until smooth. Once all the butter has been incorporated, mix in the extracts and a pinch of salt. If needed, continue to beat until smooth. To assemble: Place a small dollop of chocolate icing on the cake board. 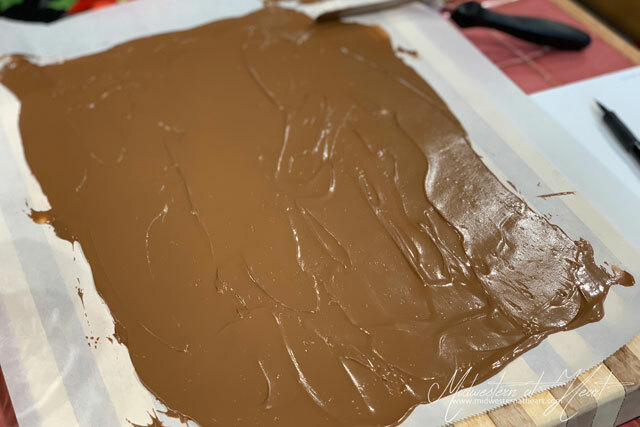 Arrange the first cake layer on the cake board and cover with chocolate fudge icing. Repeat with remaining layers of cake. 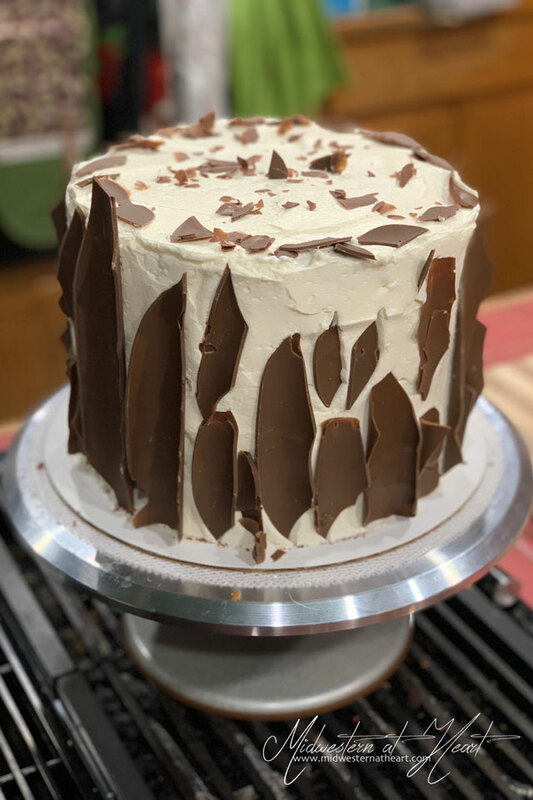 Cover the outside of the layered cake with the remaining chocolate fudge icing and place in the refrigerator for 20-30 minutes to allow the crumb coat to harden. 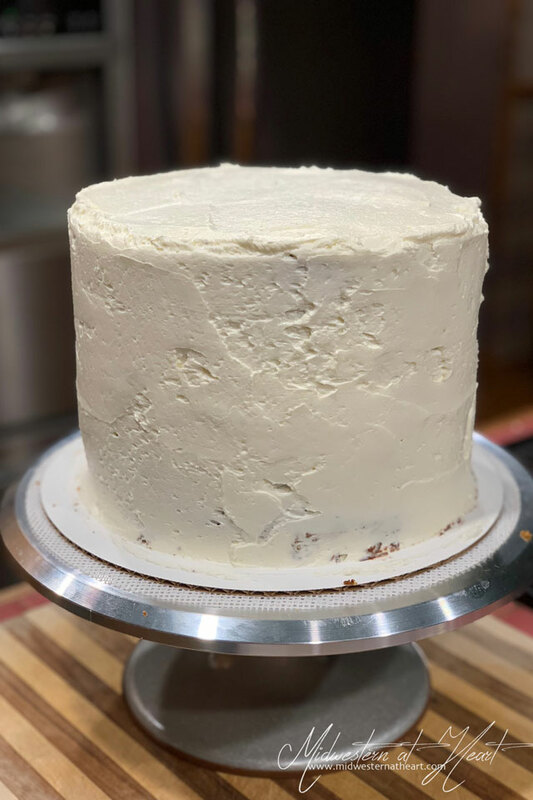 Once crumb coat is set, spread Swiss Meringue Buttercream Icing over the chocolate layer of the cake. Pull the chocolate out of the refrigerator and slowly open the parchment roll. The chocolate should break into large and small shards. Place shards on the outside of the Swiss Meringue Buttercream in random patterns. Take little shards of chocolate and sprinkle on the top of the cake. Place the remaining Swiss Meringue Buttercream into a piping bag with a large tip and make dollops on top of the cake. 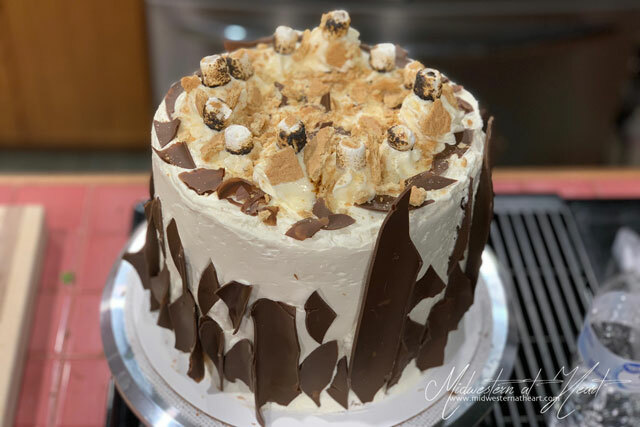 Using a kitchen torch, “cook” marshmallows like you would in a campfire and place on top of icing dollops on top of the cake. Break up the graham cracker and sprinkle over the top of the cake. Store in the refrigerator (although if it is in an auction, it will be okay to leave out for everyone to admire! ).